The roof inspection considers the conditions of the visual part of the roof at the time of the inspection. Some areas, such as underlayment, decking and some flashing, are hidden from view and cannot be evaluated. The roof inspection is NOT a warranty, guarantee or certification of any kind and is NOT a guarantee that the roof will not leak in the future. General roof: Roof covering, chimney, flashing, skylights. Roof/wall flashing: Rust, proper installation. Dormer flashing: Rust, leaking, proper installation. Apron flashing: Rust, proper installation. Counter flashing: Proper installation, rusting and other signs of leaking. Gable dormer: Proper flashings, correct installation of siding, signs of water penetration, proper construction. Chimney cap: Missing parts, damaged parts, improper installation, deterioration, spalling, sealing. Clay flue liner: Limited review of cracked flue liners, creosote buildup, blockage, spalling. Spark arrester: Proper installation, rusting, damage. Valley flashing: Wear, deterioration, proper installation. Plumbing stack flashing: Proper installation, leakage, deterioration. Plumbing stack: Proper height, damage, flashing condition. Skylight flashing: Proper installation, visible leaks, damage, rust. Skylight: Damage/cracks or leaks at flashings, condition of glass, signs of leakage. 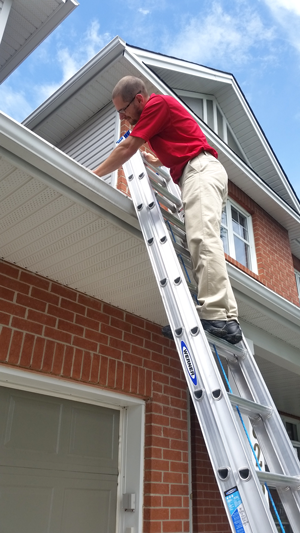 Roof vent: Proper installation, flashing, damage, restricted airflow. Roof sheathing: Inspected from attic for moisture, stains, damage, proper spacing, delamination. Fascia board: Moisture damage and deterioration, proper connections, inspect the exterior wall coving, flashings and trim. Top plate: Moisture damage/deterioration, structural components including foundation and framing. Wood lintel: Moisture damage/deterioration, inspect the exterior wall coving, flashings and trim. Felt paper: Usually not visible. We will inspect the underside of the roof deck for signs of moisture or damage.